To protest British Parliament's tax on tea. "No taxation without representation." The Tea Party was the culmination of a resistance movement throughout British America against the Tea Act, which had been passed by the British Parliament in 1773. Colonists objected to the Tea Act because they believed that it violated their rights as Englishmen to "no taxation without representation", that is, to be taxed only by their own elected representatives and not by a British parliament in which they were not represented. In addition, the well-connected East India Company had been granted competitive advantages over colonial tea importers, who resented the move and feared additional infringement on their business. 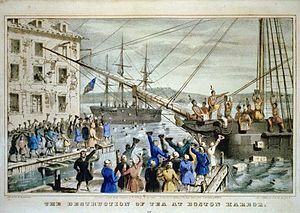 Protesters had successfully prevented the unloading of tea in three other colonies, but in Boston, embattled Royal Governor Thomas Hutchinson refused to allow the tea to be returned to Britain. The Boston Tea Party was a significant event in the growth of the American Revolution. Parliament responded in 1774 with the Intolerable Acts, or Coercive Acts, which, among other provisions, ended local self-government in Massachusetts and closed Boston's commerce. Colonists up and down the Thirteen Colonies in turn responded to the Intolerable Acts with additional acts of protest, and by convening the First Continental Congress, which petitioned the British monarch for repeal of the acts and coordinated colonial resistance to them. The crisis escalated, and the American Revolutionary War began near Boston in 1775. Until 1767, the East India Company paid an ad valorem tax of about 25% on tea that it imported into Great Britain. Parliament laid additional taxes on tea sold for consumption in Britain. These high taxes, combined with the fact that tea imported into the Dutch Republic was not taxed by the Dutch government, meant that Britons and British Americans could buy smuggled Dutch tea at much cheaper prices. The biggest market for illicit tea was England—by the 1760s the East India Company was losing £400,000 per year to smugglers in Great Britain—but Dutch tea was also smuggled into British America in significant quantities. The Indemnity Act of 1767, which gave the East India Company a refund of the duty on tea that was re-exported to the colonies, expired in 1772. Parliament passed a new act in 1772 that reduced this refund, effectively leaving a 10% duty on tea imported into Britain. The act also restored the tea taxes within Britain that had been repealed in 1767, and left in place the three pence Townshend duty in the colonies. With this new tax burden driving up the price of British tea, sales plummeted. The company continued to import tea into Great Britain, however, amassing a huge surplus of product that no one would buy. For these and other reasons, by late 1772 the East India Company, one of Britain's most important commercial institutions, was in a serious financial crisis. The severe famine in Bengal from 1769 to 1773 had drastically reduced the revenue of the East India Company from India bringing the Company to the verge of bankruptcy and the Tea Act of 1773 was enacted to help the East India Company. The North ministry's solution was the Tea Act, which received the assent of King George on May 10, 1773. This act restored the East India Company's full refund on the duty for importing tea into Britain, and also permitted the company, for the first time, to export tea to the colonies on its own account. This would allow the company to reduce costs by eliminating the middlemen who bought the tea at wholesale auctions in London. Instead of selling to middlemen, the company now appointed colonial merchants to receive the tea on consignment; the consignees would in turn sell the tea for a commission. In July 1773, tea consignees were selected in New York, Philadelphia, Boston, and Charleston. The Tea Act in 1773 authorized the shipment of 5,000 chests of tea (250 tons) to the American colonies. There would be a tax of £1,750 to be paid by the importers when the cargo landed. The act granted the EIC a monopoly on the sale of tea that was cheaper than smuggled tea; its hidden purpose was to force the colonists to pay a tax of 3 pennies on every pound of tea. The Tea Act thus retained the three pence Townshend duty on tea imported to the colonies. Some members of Parliament wanted to eliminate this tax, arguing that there was no reason to provoke another colonial controversy. Former Chancellor of the Exchequer William Dowdeswell, for example, warned Lord North that the Americans would not accept the tea if the Townshend duty remained. But North did not want to give up the revenue from the Townshend tax, primarily because it was used to pay the salaries of colonial officials; maintaining the right of taxing the Americans was a secondary concern. According to historian Benjamin Labaree, "A stubborn Lord North had unwittingly hammered a nail in the coffin of the old British Empire." 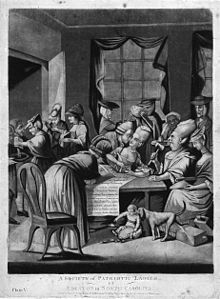 In New York, Philadelphia, and Charleston, protesters successfully compelled the tea consignees to resign. In Charleston, the consignees had been forced to resign by early December, and the unclaimed tea was seized by customs officials. There were mass protest meetings in Philadelphia. Benjamin Rush urged his fellow countrymen to oppose the landing of the tea, because the cargo contained "the seeds of slavery". By early December, the Philadelphia consignees had resigned and the tea ship returned to England with its cargo following a confrontation with the ship's captain. The tea ship bound for New York City was delayed by bad weather; by the time it arrived, the consignees had resigned, and the ship returned to England with the tea. When the tea ship Dartmouth,[a] arrived in the Boston Harbor in late November, Whig leader Samuel Adams called for a mass meeting to be held at Faneuil Hall on November 29, 1773. Thousands of people arrived, so many that the meeting was moved to the larger Old South Meeting House. British law required Dartmouth to unload and pay the duties within twenty days or customs officials could confiscate the cargo (i.e. unload it onto American soil). The mass meeting passed a resolution, introduced by Adams and based on a similar set of resolutions promulgated earlier in Philadelphia, urging the captain of Dartmouth to send the ship back without paying the import duty. Meanwhile, the meeting assigned twenty-five men to watch the ship and prevent the tea – including a number of chests from Davison, Newman and Co. of London – from being unloaded. Governor Hutchinson refused to grant permission for Dartmouth to leave without paying the duty. Two more tea ships, Eleanor and Beaver, arrived in Boston Harbor (there was another tea ship headed for Boston, William, but it encountered a storm and put aground at Cape Cod – where the tea cargo was successfully landed – before it could reach its destination). On December 16 – the last day of Dartmouth's deadline – roughly 5,000 to 7,000 people out of a population of roughly 16,000 had gathered around the Old South Meeting House. After receiving a report that Governor Hutchinson had again refused to let the ships leave, Adams announced that "This meeting can do nothing further to save the country." According to a popular story, Adams's statement was a prearranged signal for the "tea party" to begin. However, this claim did not appear in print until nearly a century after the event, in a biography of Adams written by his great-grandson, who apparently misinterpreted the evidence. According to eyewitness accounts, people did not leave the meeting until ten or fifteen minutes after Adams's alleged "signal", and Adams in fact tried to stop people from leaving because the meeting was not yet over. While Samuel Adams tried to reassert control of the meeting, people poured out of the Old South Meeting House to prepare to take action. In some cases, this involved donning what may have been elaborately prepared Mohawk costumes. While disguising their individual faces was imperative, because of the illegality of their protest, dressing as Mohawk warriors was a specific and symbolic choice. It showed that the Sons of Liberty identified with America, over their official status as subjects of Great Britain. Governor Thomas Hutchinson had been urging London to take a hard line with the Sons of Liberty. If he had done what the other royal governors had done and let the ship owners and captains resolve the issue with the colonists, Dartmouth, Eleanor and Beaver would have left without unloading any tea. In Britain, even those politicians considered friends of the colonies were appalled and this act united all parties there against the colonies. The Prime Minister Lord North said, "Whatever may be the consequence, we must risk something; if we do not, all is over". The British government felt this action could not remain unpunished, and responded by closing the port of Boston and putting in place other laws known as the "Intolerable Acts." Benjamin Franklin stated that the destroyed tea must be paid for, all ninety thousand pounds (which, at two shillings per pound, came to £9,000, or £1.12 million [2014, approx. $1.7 million US]). Robert Murray, a New York merchant, went to Lord North with three other merchants and offered to pay for the losses, but the offer was turned down. The incident resulted in a similar effect in America when news of the Boston Tea Party reached London in January and Parliament responded with a series of acts known collectively in the colonies as the Intolerable Acts. These were intended to punish Boston for the destruction of private property, restore British authority in Massachusetts, and otherwise reform colonial government in America. Although the first two, the Boston Port Act and the Massachusetts Government Act, applied only to Massachusetts, colonists outside that colony feared that their governments could now also be changed by legislative fiat in England. The Intolerable Acts were viewed as a violation of constitutional rights, natural rights, and colonial charters, and united many colonists throughout America, exemplified by the calling of the First Continental Congress in September 1774. John Adams and many other Americans considered tea drinking to be unpatriotic following the Boston Tea Party. Tea drinking declined during and after the Revolution, resulting in a shift to coffee as the preferred hot drink. The Boston Tea Party Museum is located on the Congress Street Bridge in Boston. It features reenactments, a documentary, and a number of interactive exhibits. The museum features two replica ships of the period, Eleanor and Beaver. Additionally, the museum possesses one of two known tea chests from the original event, part of its permanent collection. ^ Smith, George (17 January 2012). The Boston tea party. Th einstitute for humane studies and libertarianism.org. Retrieved 20 April 2018. ^ James M. Volo (2012). The Boston Tea Party: The Foundations of Revolution. ABC-CLIO. p. 29. ISBN 978-0-313-39875-9. ^ "Boston Tea Party Historical Society". ^ "Where Was the Actual Boston Tea Party Site?". ^ "The Shoemaker and the Tea Party". C-SPAN. November 21, 1999. Retrieved March 29, 2017. ^ Adams, John (July 6, 1774). "John Adams to Abigail Adams". The Adams Papers: Digital Editions: Adams Family Correspondence, Volume 1. Massachusetts Historical Society. Archived from the original on February 26, 2014. Retrieved February 25, 2014. I believe I forgot to tell you one Anecdote: When I first came to this House it was late in the Afternoon, and I had ridden 35 miles at least. “Madam” said I to Mrs. Huston, “is it lawfull for a weary Traveller to refresh himself with a Dish of Tea provided it has been honestly smuggled, or paid no Duties?” “No sir, said she, we have renounced all Tea in this Place. I cant make Tea, but I'le make you Coffee.” Accordingly I have drank Coffee every Afternoon since, and have borne it very well. Tea must be universally renounced. I must be weaned, and the sooner, the better. ^ "Ron Paul's "tea party" breaks fund-raising record". Archived from the original on March 28, 2010. Retrieved September 14, 2009. ^ "Boston Tea Party Ships & Museum". Retrieved June 20, 2013. ^ Denehy 1906, p. 226. Ammerman, David (1974). In the Common Cause: American Response to the Coercive Acts of 1774. New York: Norton. Denehy, John William (1906). A History of Brookline, Massachusetts, from the First Settlement of Muddy River Until the Present Time: 1630-1906; Commemorating the Two Hundredth Anniversary of the Town, Based on the Early Records and Other Authorities and Arranged by Leading Subjects. Containing Portraits and Sketches of the Town's Prominent Men Past and Present; Also Illustrations of Public Buildings and Residences. Brookline Press. 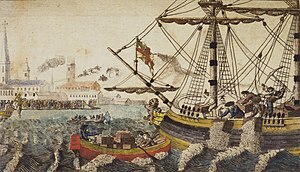 Wikimedia Commons has media related to Boston Tea Party. Wikisource has the text of the 1920 Encyclopedia Americana article Boston Tea Party.